As night falls around Russia’s largest city, a storm is brewing. Flashes of lightning illuminate the sky, while at the heart of it all, pressure of a different kind builds. In the Khamovniki district of central Moscow, the largest crowd of an eight day celebration of sport has congregated in frenzied anticipation. 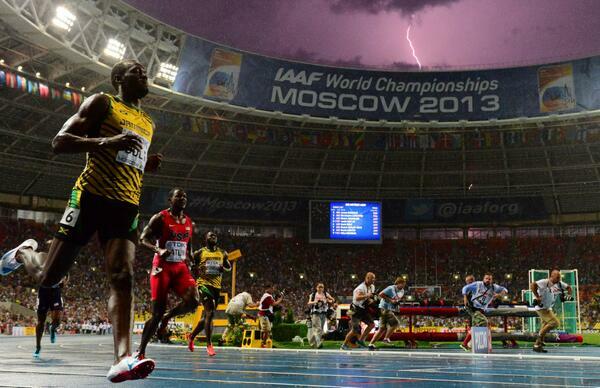 Relentless rain pounds down on the track as one of the greatest shows on Earth is set to begin. At the centre of it all one man stands astride, towering above his competitors. The cameras of press and spectators alike are all fixed on him and yet he could not look more relaxed. He wiggles his eyebrows, before raising a single finger to his lips. The whole stadium follows his lead and immediately hushes. Usain St. Leo Bolt is about to race. As Usain Bolt (pictured above) coasted to a treble gold medal haul at the World Championships in Russia, one has to wonder was Asafa Powell watching? Powell (pictured below) was once the fastest man alive, the one who bathed in the glory and the prestige that accompanies that title, but now he’s joined the ranks of a different category of sprinter. 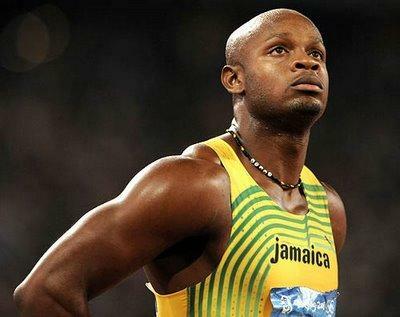 Ben Johnson, Marion Jones, Veronica Campbell-Brown, Justin Gatlin, Tim Montgomery and Dwain Chambers, were joined by Powell and American rival, Tyson Gay, in the group of world class sprinters who have been embroiled in doping controversies. Powell, a consistent performer on the world stage, has broken the world record 4 times during his storied career. Yet the focus on Powell will no longer be on his past glories, instead it’ll be on trying to establish whether the Jamaican and many others within track and field are knowingly doping, or just falling foul to the carelessness of others. In the last month, Powell and Gay have both tested positive for the banned substance oxilofrine. The nature and source of oxilofrine has led to both athletes denying any knowledge of using a banned substance, and instead the spotlight is being placed on supplement use among professional athletes. Sport’s governing anti-doping agency, WADA, class oxilofrine as an amphetamine stimulant that is banned due to it’s potential to accelerate the body’s natural fat burning process. Although the potential benefit of this to professional athletes is abundantly clear, there is strong support emerging to suggest that there is every reason to believe that its use may be unintentional. Pharmacists have claimed that in small factories that produce vitamin supplements, as much as 70% of supplements may contain ingredients not listed on their packaging. This isn’t even accounting for quantities that are accidentally contaminated, thus containing banned substances. On top of this, supplements containing oxilofrine would be a key component of a body builder’s training regime, and completely legal within that arena. In the wake of their respective scandals both Powell and Gay shifted the blame and responsibility on to those within their team, their so-called inner circle. 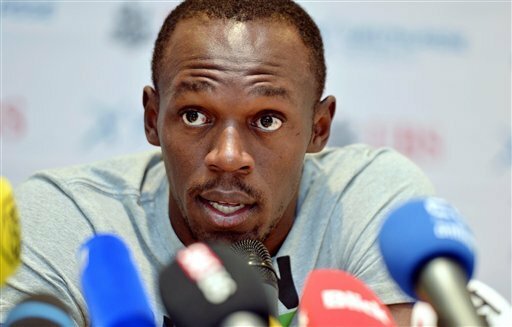 When the possibility of inadvertently taking a banned supplement was put to Usain Bolt before the World Championships he responded by saying, “You have to be careful as an athlete what you do and what you ingest, the food you eat and stuff like that. But I am not worried because … I have a great team around me to make sure everything go smoothly.” This concept of total trust must scare those invested in athletics, whether financially or emotionally. The notion that these professional athletes, responsible adults, leave their livelihoods in the hands of others is absurd. This means that Bolt, now widely acknowledged as the greatest sprinter ever, risks his whole legacy being tarnished because of errors made by others. If an athlete spends their whole life training to reach the peak of their sport, is it really too much effort to go to, to prepare their own food? Or to take sole control of the vitamins and supplements they ingest? 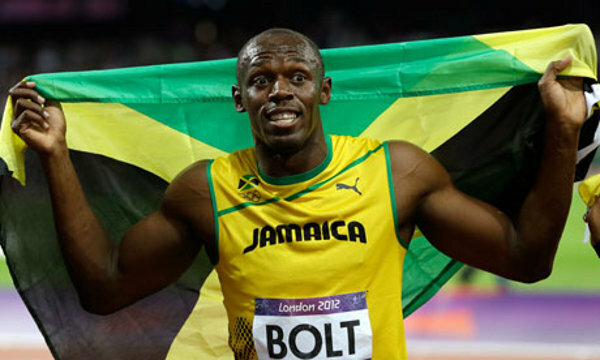 If the likes of Powell and Gay can fall foul to doping, why won’t Bolt? Powell and Gay may return to sprinting to once again be forces at the highest level of athletics, but they are unlikely ever to be viewed in the same way. 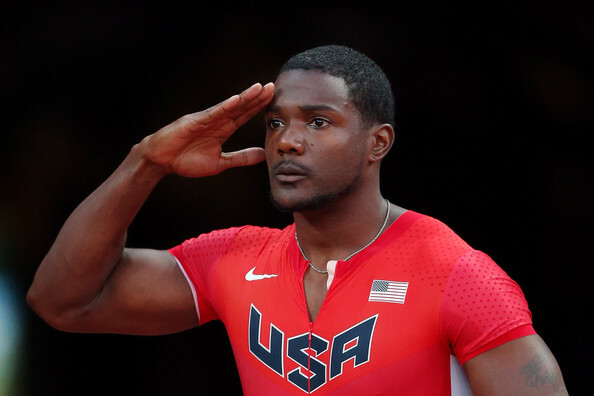 Since Justin Gatlin (pictured above) returned from a ban he received for a breach that he claimed to be innocent of, he has been roundly booed at athletics events around the world, and there is no reason to believe Powell and Gay will be received any differently. Athletics is a sport which seems to need superstars to thrive, and this surely means that its future must be viewed with some trepidation. In this sense, Usain Bolt is among the last of a dying breed, a legitimate and clean sprinting superstar. Even if he may well be the most honest and talented athlete of his generation, it does not necessarily mean that he will never fail a drugs test. Even if an athlete has no intention to dope, it seems to have become much easier to fall foul unknowingly. The worry for athletics is if Usain Bolt ever does find himself in such a scandal, would the credibility of the sport fall with it? Perhaps Bolt would be best advised to avoid the likes of his beloved chicken nuggets in the future.